It does not matter in which part of world you are superstitions always follow you and are present in every where with in the locals. Few days ago we invited some of our Swedish friends over Indian dinner (as their taste buds are compatible with spicy food) and while chatting with them topic of Superstitions came and we were surprised to find few of Swedish superstitions common with our Indian superstitions. We didn't expect to have commonalities in few of our very common superstitions. 1. If a black cat crosses your path then it is treated as bad luck and to cancel it Swedes spit three times or wait some one other to pass. 2. Sneezing: I remember that we ask that person to sneeze one more time to cancel the bad effect while Swedes consider it as your enemy has mentioned your name and ask you to say 'prosit' or to make a pair of sneeze. 3. Don't go under a ladder, I remember this as told by my grand mother but I never understand the exact logic (may be something fall you and you get hurt) but Swedes consider it as bad luck for 3 weeks. 4. Touch wood: I think for us this one is a modern one but Swedes also touch wood to prevent something nasty happened with a line "Pepper, pepper touch wood". 5. Not to step on a crack in the street. If you do it will bring terrible, irrevocable misfortunes. 6. Never put your keys on the table. 7. Spilling salt gives bad luck. 8. An open umbrella indoors spells serious bad luck. So, that's why I said that it doesn't matter in which developed country you are people are superstitious every where. Well, I can say I am little superstitious, I mean, why to take chance when you come in such situation but I don't follow all of them. When I saw a black cat crossing my way I just wait for some one else to pass it first, I know that's selfish but that's how I cancel its effect and I don't follow the days to cut my nails, hair but I have stopped putting my keys on table from the moment I came to know about this Swedish one. Well, are you superstitious? What!! you said no, come'on!!! I know you are... Chalo tell me which one you follow. Yes, that's what exactly I am thinking, I wish if I could have more than 24 hrs in a day. Arey yaar kitna kuch karna he time hi nahi mil rha and my TO DO list is growing day by day.This laziness and mood to do nothing is keeping occupied me to do nothing and only keep me thinking and planning about ticking those items from my yellow sticky notes. Uff!! ye lazy lazy lamhe. And, jab mood karta he tab neend aa jaati he or it is too late in the night that I had to leave it undone so that I can reach next day office on time. Wo saying he na ki "Aalasaya manushya ka shatru he" but I think these days this Aalasaya is my best of best friend. Every day after getting home from office I get on to the couch and leave it to answer either nature's call or to go to sleep. Yesterday was the epic, I slept on the couch and when a loud voice (from my wife) broke my sleep I simply changed the place of sleeping from couch to my bed just like a small boy who do the things silently which his parents told him to do with a scared and about to weep face. 1. My friend has asked me to design his website in the month of May and I have not completed it so far. Neither I am giving up nor I am completing it. WTF I am doing!!!!!!! 2. Its only one year left for me before I turn 30 and I have to start controlling my sugar intake, start some exercise to be on healthy side of 30. 4. I have to finish reading my unfinished novel. 5. 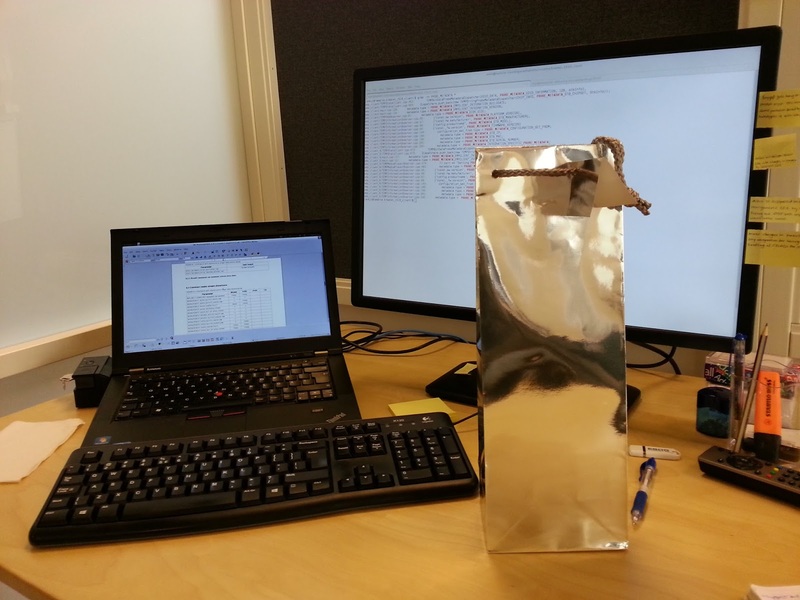 I have to study some technical things related to my job on a very serious note. 6. I have to do some more studies for my certifications. Well, the purpose of writing this list is to give it to the world so that world can help me to complete it. Ab aap soch rahe honge ki kya funda hua illogical sa... to ye funda nikala he The Secret book se... usme kehte he na secret batane waale log "All you need is to tell the world what you want and the world will attract those things towards you" so for now I want this Yellow sticky note in the recycle bin. Labels: Laziness, to do list, turning 30, un finished tasks. 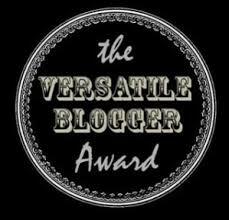 Recently I have been awarded with "The Versatile blogger award" from my blogger friend Pooja who writes her blog Thoughtless Ramifications. Well, there was no award ceremony for it through which I got it but one day when I visited her blog from my blog feeds I was surprised to see that she chose me to share this award with me. 1. I love eating all sweet things specially cakes, pastries, ice-creams and Indian sweets with out thinking their effect on my body. 3. I love cooking and it leads me to give suggestions to my wife which sometimes turns in to more suggestions rather than appreciations. 4. I don't why but I always seek perfection in things and I also try to do things in perfect manner. I know sometimes somethings get worse to make them perfect and they are perfect being imperfect but still I always try it. 5. I love travelling to new places and gaining new experiences. 6. My favorite time pass is to observe people when travelling through bus, train or any public transport. 7. I bother a lot about people or I am too conscious about people i.e. I always think ki "main aisa karunga to mere baare me log kya sochenge, kya kahenge, mera mazak udayenge" which sometimes leads me to not enjoy in some scared situations or moments. I would like to share this award to my other fellow bloggers and I hope I will add more people in chain. Supriya Garg: Being what I always wanted to be. Congratulations guys!! I hope you all keep writing on your blogs from your heart, mind and soul. The day that went by. So, it was my 29th birthday with full of surprises and I still have 1 year to turn 30, I don't know how I am gonna feel on turning 30 but lets forget about it. Tab ki tab sochenge :) ... back to the topic again.. 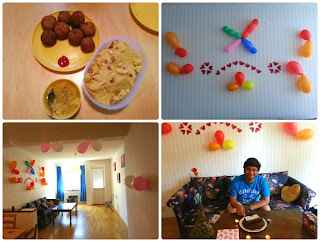 So, it was my birthday and it was a working day so I had to go to the office but the day started with some breakfast surprises, my wife made my favorite things in breakfast and there were the things which I am not allowed to eat very often. When I saw cheese balls and Moong ki daal ka halwa served for me my eyes were gleaming like a 5 year old child who gets happy to have candies and chocolates. When I came back to my home in evening my lovely wife has decorated our living area for me for my little bday celebration and she has invited few of our Indian friends as well. 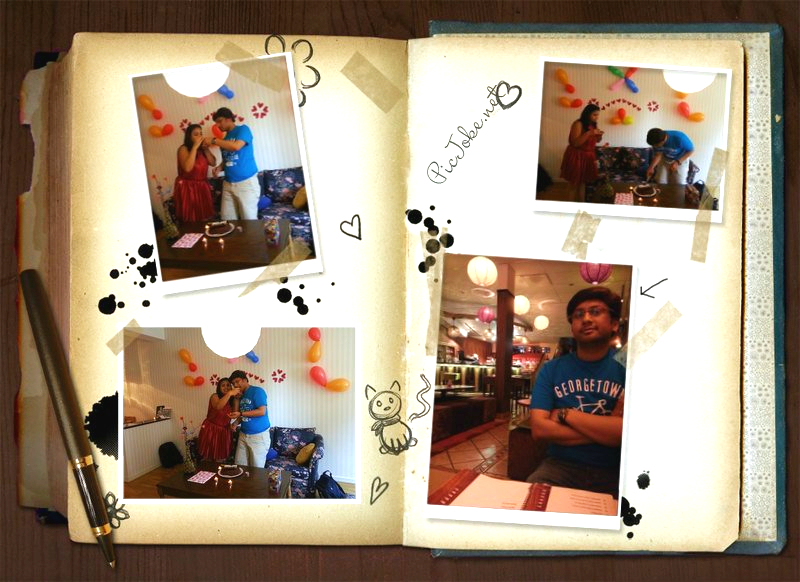 Bas, fir kya tha...wohi sab.. cake cutting, bday jingles, exchange of cake and cake facial. at least we had some friends here to come over otherwise we two would have celebrated it by ourselves. The best thing of the day was cake, it was so yummy!! That's why I love Europe, you will get many varieties of breads, cakes, pastries, bun etc and if you are a sweet lover then you will always crave to have those fancy looking items. Lastly, we went to an only Indian restaurant here for dinner and my special day got finished with the cup of ice-cream.